Like Windsor, Sarnia is a moderate-sized urban centre located on Canada’s border with Michigan. 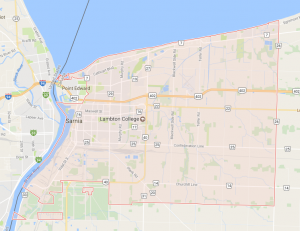 A well-established town that still depends heavily on the petrochemical industry, Sarnia has had its problems in the past, but has managed to avoid the economic doldrums that has afflicted its larger sister city. It boasts a sizable apartment market – mostly in small buildings of 50 units or less. Sarnia managed to weather the 2008 recession far better than Windsor. Vacancy rates in the city are high by provincial standards but much lower than in Windsor. Average rents have also increased steadily. These conditions, while modest, have still allowed the market to increase, with five new buildings added in the last ten years. Vacancy rates are higher for three bedroom apartments, continuing a pattern identified in 2009 that saw Sarnia buck the provincial trend that favoured these family-friendly units. Sarnia looks set for slow but steady growth in the near future as trade increases through the Bluewater Bridge crossing with the United States. The market appears stable and vacancy rates, while high, do not show a big gap between supply and demand. Opportunities for long term holders north of Highway 402. Short term and reposition opportunities at city’s south end. Rental supply is scattered geographically in the city, the best stock is found near the river and downtown. The downtown core is attractive and an asset. Diversified ownership may allow acquisition.